Just got back from an AMAZING talk by Huwaida Arraf, co-founder of the International Solidarity Movement. 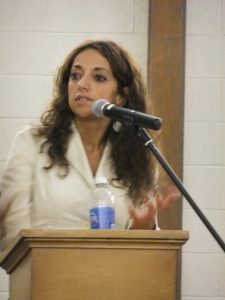 She spoke for two hours about her own experience as a Palestinian-American who went to Israel to work and how that evolved into dedicating her life to seeking freedom and human rights for Palestinians in the Middle East. Yes, it was long, but the story — including horrifying details of the attack of the flotilla this past May — was riveting. An OKC chapter of ISM is forming, so get in touch with Kathy McCallie if you are interested. The talk was videotaped and I’m told it will be on YouTube in a day or two (I’ll update this page when it’s available). I highly recommend it.